It was back in the 1970s that Gobur first began experimenting with the concept of a folding caravan. With many people living in smaller compact properties, roads becoming more congested and the cost of fuel increasing almost daily, the considerations made when designing the first products are just as relevant today. The Carousel brand was introduced in 1982 and continued until production ceased in 2016. 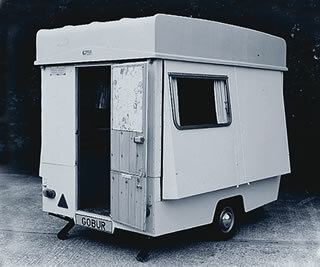 The picture opposite is of an early 1970s Gobur Govan which was one of the first, and most loved models produced. One of our smallest folding caravans, the 9′, rear door, Gobur Midway was the forerunner of today’s ‘Slimline’ models, at only 5’8″ wide. The only Gobur model made on a ‘twin-axle’ chassis, the ‘Maximin’, shown with one of the first fibreglass roofs, replacing the handmade, aluminium style. One of the first models named ‘Carousel’, an early 10/2, the replacement for the 10′ Midway.